The 2003 Rally XIV is now finished. The turnout was less than other years, but certainly no less diverse with members attending from as far away as Georgia and Montana. Friday afternoon the riders began arriving at the Day's Inn Hotel in Kingston. I was first there at lunch towing two CX500 Turbos to the rally. Next in was Dennis McCartney and his wife Susan from Pennsylvania, towing his immaculate and very low mileage CX650 Turbo. 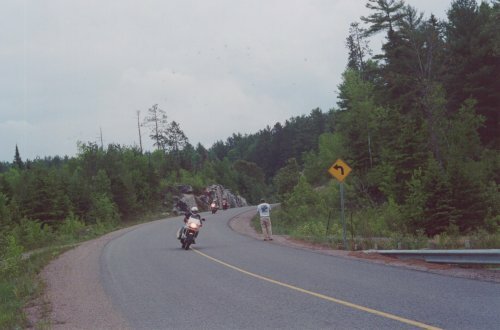 Following soon after was Mort Milne also from Pennsylvania with his GPz 750 Turbo in tow. 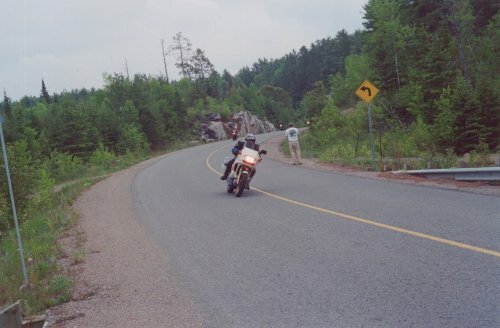 Then Trevor Topley arrived from southern Ontario riding his CX650 Turbo. John Marrs and his wife Margaret were on vacation in upstate New York, but without a motorcycle. I loaned them the use of one of my Turbos and they were able to take a couple days off to attend. Bob Miller our esteemed President also arrived on his trusty Seca Turbo. Robert Mitchell arrived late in the afternoon on his recently reassembled XN85 Turbo. The most surprising attendee at the rally pulled into the parking lot mid-afternoon. I walked over to greet this rider who I had not seen at any of the previous rallies. He took his helmet off and introduced himself as Arlie Rauch. I stood there for a moment to process the information and realized that this was our Membership and Circulation Director. Then I realized that he lived in Montana! Arlie Rauch had just driven 3 days and 1,600 miles to attend this year’s rally. I was truly impressed. By four in the afternoon the main contingent had arrived. After much discussion we decided to take a tour down the river to the little community of Picton for dinner. I would lead the pack in the John Marrs Saturn with Arlie Rauch (after three days on the road he figured he could use a rest from the bike for a bit!). John Marrs took my good CX Turbo and his wife Margaret agreed to ride with John, apparently for the first time in years! So with half a dozen bikes in tow I led the group down to Picton. The route followed the St. Lawrence River down to Lake on the Mountain where a free ferry ride took us across the bay. 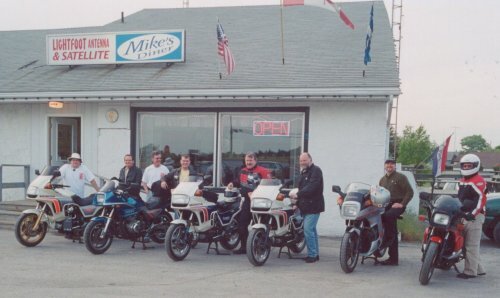 Here's a picture of the whole crew in front of Miukes Dinner on Friday night. From left to right: Colin Goodall, John Marrs, Arlie Rauch, Robert Mitchell, Dennis McCartney, Trevor Topley, Bob Miller, Mort Milne. The bikes cross the bay at Lake on the Mountain on the way back from dinner. On the ferry a local offered a recommendation for dinner and gave us the usual directions proffered by locals in this situation. "Go down to the liquor store and turn left". Arriving at the restaurant we all invaded the small place and managed to take over 1/3 of the restaurant. After dinner we all gathered outside for a picture before heading back to the hotel. The next morning we all prepared for the ride. After a quick Riders' Meeting we gathered for the ceremonial group picture before heading out for the day. The ride that day followed the route sheet that I had laid out in advance. We were ready to cut the ride short if the rain moved in, but that proved not to be a problem. 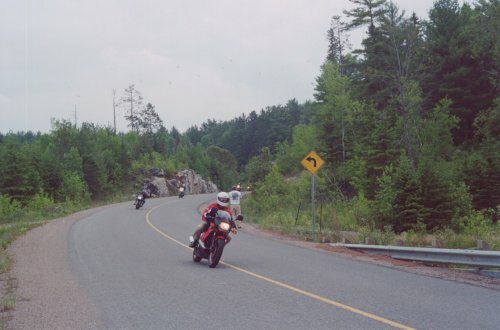 Except for some damp roads around the Calabogie area the ride was rain-free. 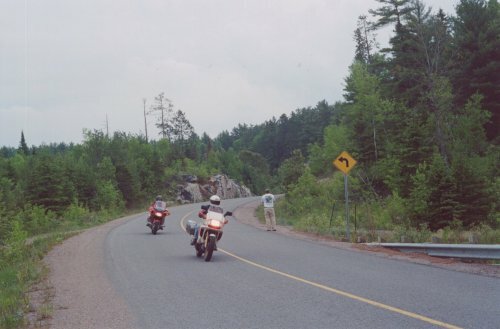 The route carved a path north from Kingston and into the heart of the Madawaska Highlands. The traditional group picture before heading out on the Saturday ride. From Left to Right: Peter Goodall, Colin Goodall, Robert Mitchell, Bob Miller, Trevor Topley, Arlie Rauch, Mort Milne, John Marrs, Dennis McCartney. Partway through the morning run we realized that the chase car would be better suited as a photo car. From then on Dennis and John would sprint ahead of the pack when we stopped for a gas break in order to set up for a photo-op. We got two photo-ops in before the blackflies forced them back to the comfort of the car, but they were able to get some good pictures and even a short digital video clip. In this video clip you will see the bikes fly by on there way to the lunch stop in Denbigh. 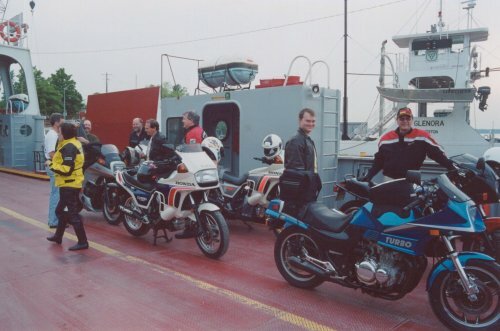 In order of appearance: Colin Goodall (CX500), Milt Morne (GPz750 Turbo), Robert Mitchell (XN85), Trevor Topley (CX650T), Arlie Rauch (CX500T), Peter Goodall (Pacific Coast 800). This is the first of four pictures taken at one of the impromptu photo-ops. Here's rally host Colin Goodall on his CX 500 Turbo. In this picture we see Mort Milne on his GPz 750 Turbo followed by Robert Mitchell on his XN85 Turbo. This is Trevor Topley on his CX650 Turbo. Finaly we see Arlie Rauch on his CX500 Turbo and Peter Goodall (father of rally host Colin Goodall) bringing up the back of the pack on his Honda Pacific Coast 800. Lunch was at the Swiss Inn in Denbigh. After everyone was gassed up we hit the road for the last leg of the ride. All the concerns we had about rain dissipated as we rode into sunshine and clear skies for the last hour back to the hotel. After we all arrived back John and his wife Margaret thanked us all for a great time and started heading back for home. They were actually on a multi-week vacation visiting family from Georgia all the way up to New York State when they took a couple days out to attend the rally. Troy Marcotte and Jennie Miller who were not able to attend for the ride were able to make it down from Ottawa for the evening. They rode two up on an XN85 in pristine shape and for the first time in a long time there were more XN85 Turbos at the rally than GPz750 Turbos! Later that evening we all headed over to a local restaurant for dinner and a debrief of the day’s ride. The consensus was that the route was not as “mountainous” as in years past, but was still an excellent ride. The next morning the group started to break up and head for home. Arlie started the long ride back on Sunday morning, but not before being directed to check out the hydraulic lift locks at Peterborough on the Trent-Severn Waterway. Robert Mitchell, who had struggled to get his bike ready to go to the rally the week before, had run into his own problems. The 600 mile sprint north on Friday had used up the last of his tread. Dennis McCartney stepped up to the plate and made room in his trailer to tow Robert's bike back to his place in PA. There Dennis put a new rear tire on which got Robert the rest of the way home. Thanks to Dennis for his great generosity! Bob, Mort, Troy and Jennifer decided to go for a river cruise before heading for home. They followed the St. Lawrence River down to Gananoque to enjoy a river cruise of the Thousand Islands. In spite of a lower turnout than usual the Rally still proved to be a success for all those who attended.